How in the world did we ever manage back in the Dark Ages before Google? I told you earlier that the boy, who is a very strict vegetarian, is coming in from the ‘Burgh for Thanksgiving and I’d like to make him a pumpkin pie, but I don’t know how to make one without eggs. Well, through the magic that is Google, I found a recipe for vegan pumpkin pie that sounds worth trying. 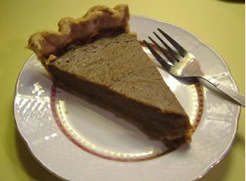 It is called Bryanna’s Vegan Pumpkin Pie and you can get the recipe by clicking the link. I’ll let you know how it turns out. In order to simplify the cooking this year, I think I’ll just make one batch of mashed potatoes and use vegan margarine and soy milk. Last year I made a batch the usual way, with butter and milk, and a separate batch for the boy with margarine and soy milk. But it’s hard to tell the difference, so why bother? For far too many Americans this year, Thanksgiving won’t be a joyous occasion. We’ve fallen on hard economic times, thanks to the reckless deregulation of markets that began under Reagan and really accelerated under G. W. “The Fundamentals of the Economy Are Strong” Bush. Things are surely going to get worse before they start improving, but I am hopeful that President-elect Obama will be able to turn things around. It’s a formidable task, but I think Obama is up to it. As I contemplate all that I have to be thankful for this Thanksgiving, I will remember that not everyone is as fortunate as I. I think I’ll dip into my holiday savings and make a donation to the Central Pennsylvania Food Bank. One less Solstice present means one more holiday dinner for a family that has fallen on hard times.